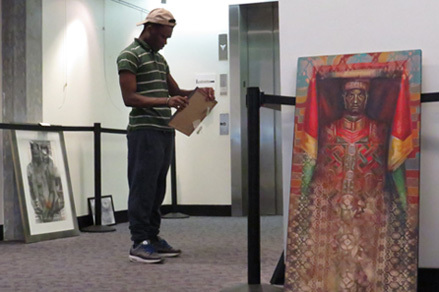 Black History Art Installation: Rocky Cotard, a Boston Arts Academy senior from Mattapan, curates the art exhibit, “A Story We Share: Massachusetts Artists Celebrating Black History and Culture, at the Commonwealth Museum and Massachusetts Archives on Columbia Point. The public is invited to the opening celebration on Wednesday evening at 6 p.m. For further information call 617-727-9268. “So, I can be a curator even though I’m only 14?” exclaimed the high school student. Yesterday evening, more than 100 guests flocked to the second floor gallery of the Massachusetts Archives on Columbia Point for the opening reception of “A Story We Share: Massachusetts Artists Celebrating Black History and Culture.” While an exhibit by black artists during February is rarely front page news, what is remarkable is that this show has been curated by three Boston Arts Academy (BAA) high school students, all of whom happen to be Dorchester or Mattapan residents. Though the title of the show suggests a wide cross section of Bay State African-Americans, most of the artists live and work in Dorchester, from which neighborhood the three young curators also hail: Stacy Lafume (Mattapan), Rodrick Guevara (Dorchester), and Rocky Cotard (Mattapan). Out of the 24 pieces on display 18 are by Dot-based artists (Stephen Hamilton, Laurence Pierce, Lucilda Dassardo-Cooper, Shaanti Williams and Adam Bullock), while the other six pieces are by the two who are based elsewhere in Boston: Paul Goodnight and Ekua Holmes. When she was a high school student in Connecticut, Palmer learned a lot about the practical side of arts promotion when she worked as a student docent at Artspace in New Haven. She has since curated many shows in Boston, including ones at Dot’s Erick Jean Center and the now-shuttered Hancock 309 Gallery. She’s very eager to share what she has learned with the next generation. Palmer allowed the three students to select the pieces from artists’ websites and her own extensive private database. Lafume, Guevara, and Cotard also handled all the hanging and installation. They hired Charged, a BAA band specializing in “jazzy, neo-Soul,” to provide cocktail music for the evening. Guevara, who is in the Drama department, persuaded some fellow future thespians to staff the coat-check facilities. Additionally, Palmer was able to arrange studio visits with Goodnight, who is probably the most prominent and financially successful artist in the show. The apprentice curators have learned a tremendous amount about the business, mechanics, and practical “behind the scenes” grunt work that goes into becoming prosperous artists. Working so closely with BAA teachers and alums like Bullock have made the goal of becoming professional artists seem much more attainable and realistic. The show continues through the end of February Admission is free to both the exhibit and the museum. The Commonwealth Museum is open Monday to Friday from 9-5 and free parking is available. For further information or special programming, please contact specialevents@sec.state.ma.us  or call 617-727-9268.